Modern helicopter pilots watch the Sierra Bulletin Board System for Sierra's 3-D Helicopter Simulator Shoot-off! 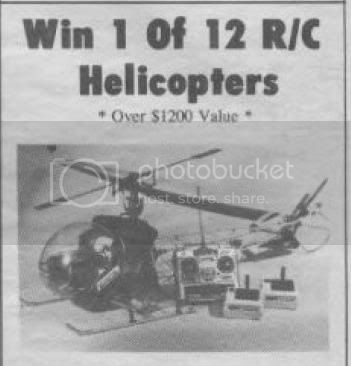 12 remote-controlled helicopter models, each valued at over $1,200 are up for grabs. They will be awarded to the 12 highest scoring pilots. Call Sierra's BBS at (209) 683-4463 for more details. Sierra Ships 3-D Helicopter Simulator!